Sell Your House Fast in Los Angeles - The Ultimate Checklist [Infographic] | The Shenbaum Group, Inc. However, a smooth sale will require some advanced planning in a few different key areas. 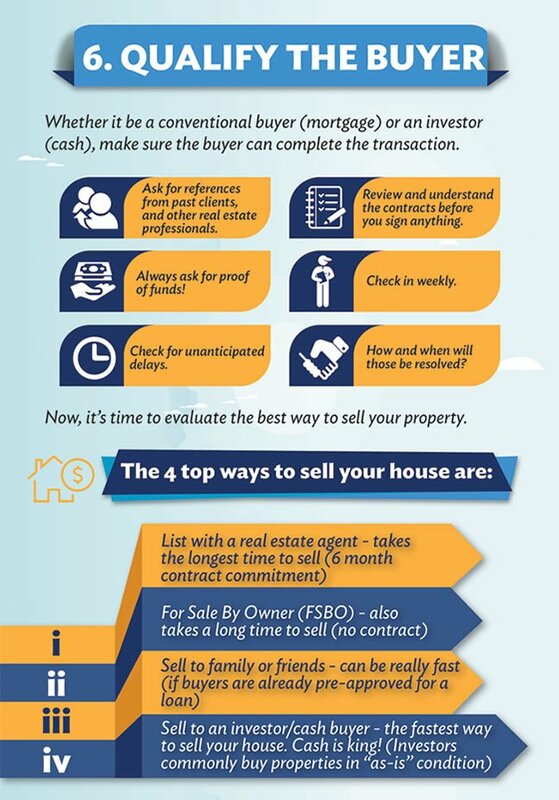 If you follow this checklist and plan out the process well, you will not only be able to sell your house fast but, ultimately, you will have a very successful house sale. Most importantly, if you want to sell your house fast you need to take action. 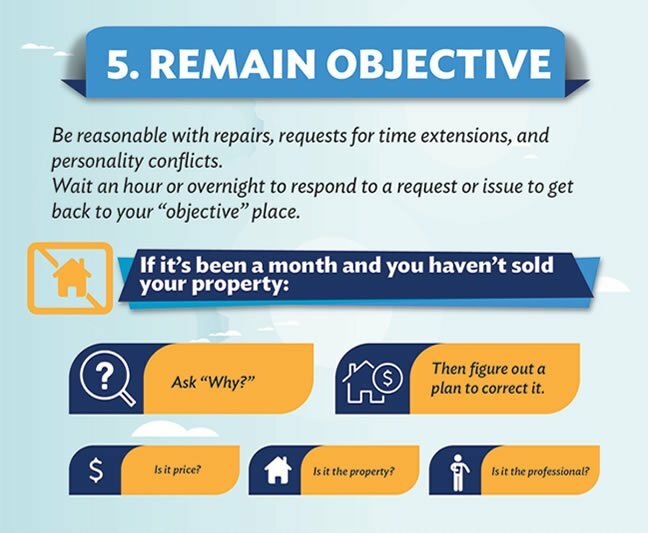 By using this checklist, making the necessary decisions and, most importantly, acting upon them, you will sell your house. Deciding on a sales price that will make you happy is half the battle right there. 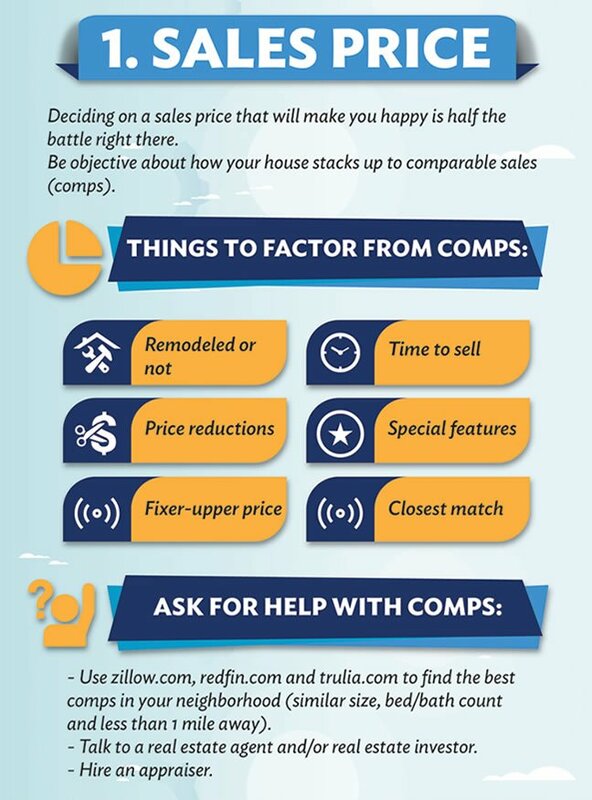 Because you need to be objective about how your house stacks up to comparable sales (“comps”) and that is difficult to do. There are many factors that go into determining the market value of a house. What are fully remodeled homes selling for in your area? How long did they take to sell? What special features does each of these “comps” have and not have? What about “as-is” properties that need upgrading? Which “comps” are closest in size, bed/bath count, and level of upgrades, to my house? Look for homes that are similar in size and bed/bath count and that are less than one mile from your property (same zip code and the same side of major streets that define neighborhoods). Use zillow.com, redfin.com, and trulia.com to find the best comps in your neighborhood. Have a real estate agent and/or real estate investor show you comps in the area. Real estate agents can provide you with a CMA (Comparative Market Analysis) that will give you a good list of comps. Make sure to compare it to what you find doing your own research. Hire an appraiser to evaluate your home’s value. Appraisals typically cost about $300-$500, which is negligible in comparison to the thousands it can save you. See how each of these results compare to your house. Make your own checklist to compare features of each of these houses. Remember to be objective. Knowledge is power. And you want to sell your house fast, not bungle the deal. Properties are harder to sell when tenants are still living in them. 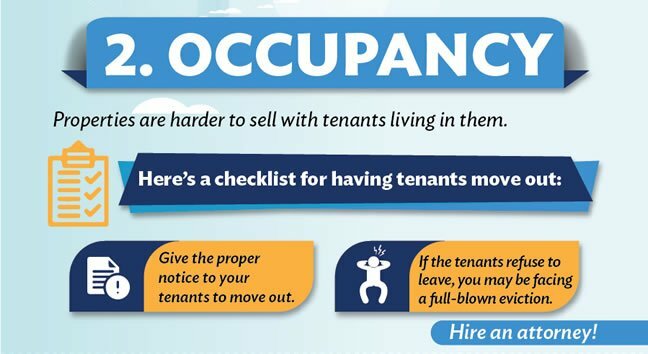 So, you may want to consider having tenants move out before listing or selling your property. Showings can be difficult, too, and you will never know the condition of the property on any given day. Also, you never know what a tenant is going to say about their experience with the property or with you. Give the proper notice to your tenants to move out. Every state has a different protocol, so ask an attorney for the appropriate way to handle this. If the tenants refuse to leave, you may be facing a full-blown eviction, which can be expensive and time-consuming. You’ll want to hire an attorney to help you with this, as most landlords do not handle the eviction process properly and have to start from scratch many months down the road. While hiring an attorney sounds expensive, they can save you a lot of money in the long run. Obtain a “Title Report” on your property. Many title officers and/or escrow officers will provide this report for free, especially if they believe that you will use their services on the sale of the property. And if they treat you properly, you should definitely consider doing this. 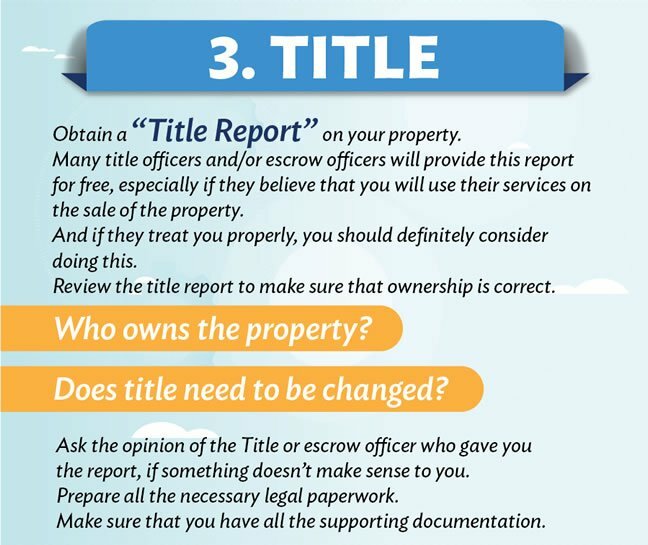 Review the title report to make sure that ownership is correct. Does title need to be changed? Ask the opinion of the Title or escrow officer who gave you the report, if something doesn’t make sense to you. Prepare all the necessary legal paperwork. Make sure that you have all the supporting documentation. Having a confident and experienced professional and/or buyer working with you is the key to success. 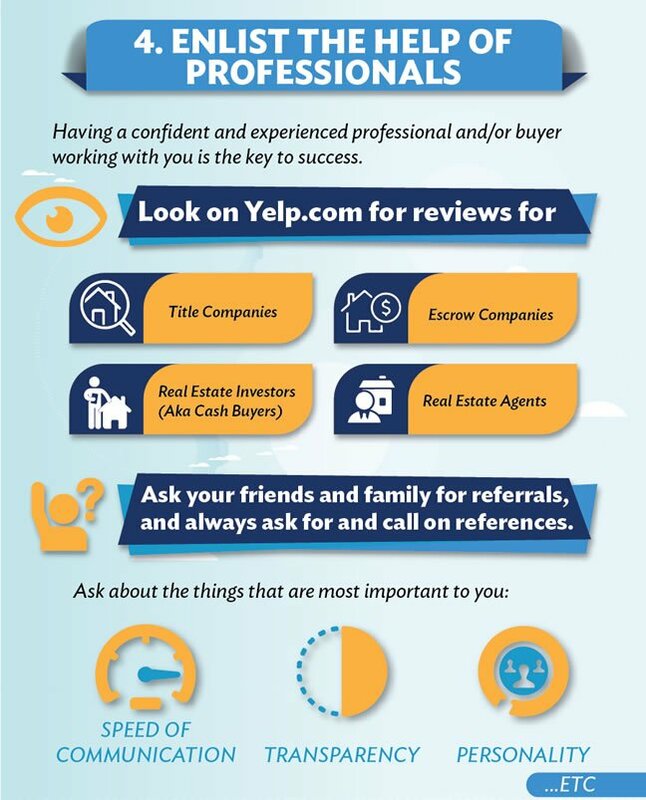 Look on Yelp.com for reviews for title companies, escrow companies, real estate investors (aka cash buyers), real estate agents (if that’s the path you choose) and ask your friends and family for referrals. …And always ask for and call on references. That’s one of the easiest ways to learn if a professional is going to be a good fit for you. It’s especially important to ask about the things that are most important to you, such as speed of communication, transparency, personality, among others. It’s easy to get caught up in the minutia, those small things shouldn’t make or break a deal. So be reasonable with repairs, requests for time extensions, and personality conflicts. Sometimes waiting an hour or overnight to respond to a request or issue will allow you time to get back to your “objective” place. Also, if it’s been a month and you haven’t sold your property, you have to ask “Why?” (especially if you really wanted to sell your house fast) and then figure out a plan to correct it. No matter which method you ultimately choose to sell your house, the buyer’s ability to perform and close on the sale is the absolute key. Whether it be a conventional buyer (one who is getting a loan from a bank) or a cash investor, make sure the buyer can complete the transaction. Ask for references from past clients, as well as from other real estate professionals. Review and understand the contracts before you sign anything. Always ask for proof of funds! Check in weekly and ask how is it going. Are there any unanticipated delays? How and when will those be resolved? Now, it’s time to evaluate the best way to sell your property. You want to sell your house fast. Exactly how fast do you want that to happen? List with a real estate agent – this can take the longest time to sell of these 4 options. Be prepared to sign a contract that binds you to work with that real estate agent for a certain number of months (usually a minimum of 6 months). For Sale By Owner (FSBO) – also takes a long time to sell, even longer than traditional listings if not done properly. If you are emotionally attached to the house, this probably isn’t the best option for you. 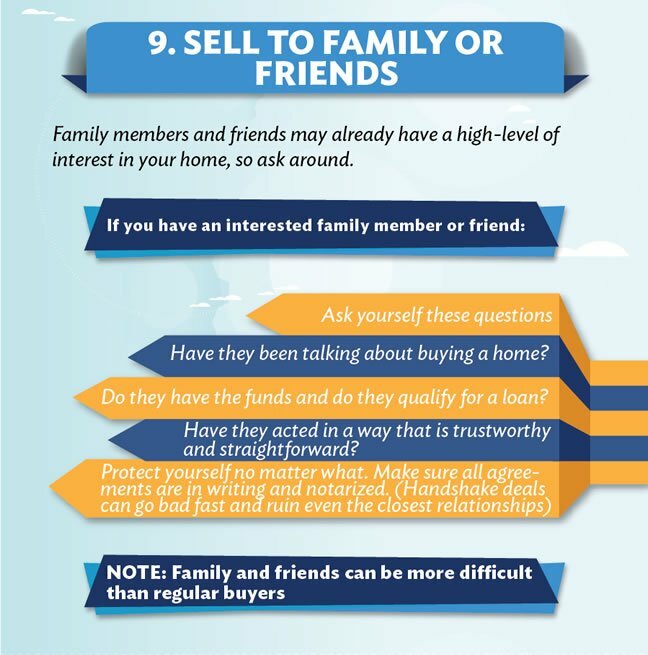 Sell to family or friends – can be really fast if family members or friends are already pre-approved for a loan or if you are willing to provide owner financing (make sure you are comfortable with the buyers and their ability and willingness to pay). Sell to an investor/cash buyer – This is the fastest way to sell your house. Cash is king. And you can sell your house without putting in the effort or cash to maximize profit (which may or may not work out). Investors commonly buy properties in “as-is” condition, meaning they won’t request any repairs and will even let you leave behind any personal property (such as old furniture, mattresses, broken items) that you don’t want to take with you. Do you want the absolute top dollar? Fixing up a property and listing it on the MLS will generally yield the highest return. The other side of that is the fact that it will take much longer (months to a year) and requires a great deal of money, energy, and patience. 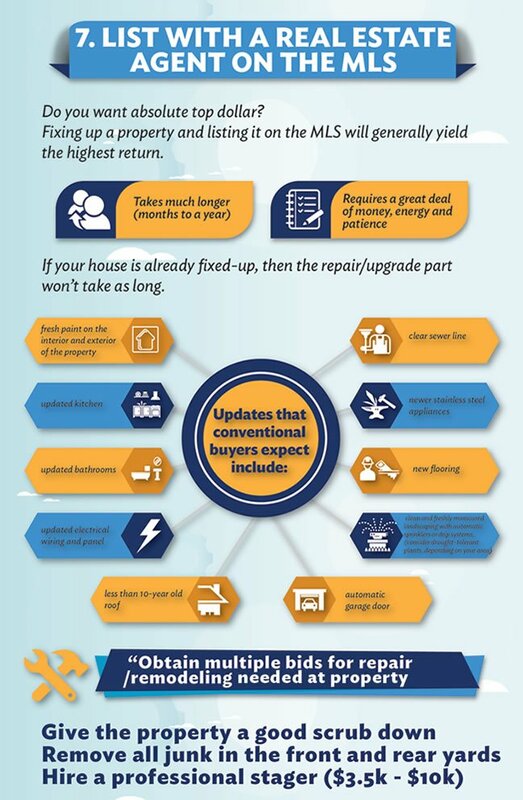 If your house is already fixed-up, then the repair/upgrade part won’t take as long. Plan on having your property in move-in ready condition if you plan on listing the property on the MLS. Do this by evaluating your property’s needs to be considered “move-in ready”. Depending on which items in the above list need to be upgraded, here is a great method for getting them done properly. We always suggest getting 3 bids for each job. Also, ask for references, check their online reviews, and make sure their contractor’s license and insurance is up to date. Don’t forget to ask if the city requires permits and inspections for the work being done. The last thing you want is unpermitted work coming back to haunt you years down the line and costing you thousands of dollars. Nothing is more distracting to conventional buyers than dust, rust, and grime. Also, try to remove any lingering odors (especially cigarette and pet odors). Tuck it away or throw it out. This not only makes the living space feel cleaner but it also makes it feel bigger. Call your trash company and see if there is a free bulky-item pick-up program. This is a great way to get larger unwanted items (such as old couches and mattresses) out of the way. If you’re selling your house, you probably need to get rid of it anyway. Staging typically costs anywhere from $3,500 to $10,000, depending on the size of your house. If that’s too expensive, have a stager come in and use some of his/her furniture and utilize some of your own, which can cost less than a full staging. If there’s no budget for hiring a stager, then try to remove as much clutter from each room and keep the house tidy for showings. Go to local open houses, see how other homes show, and make your property comparable to the nicer homes. This method is not for the faint of heart. In fact, I don’t recommend it unless you have had experience selling houses, such as being a former real estate agent. 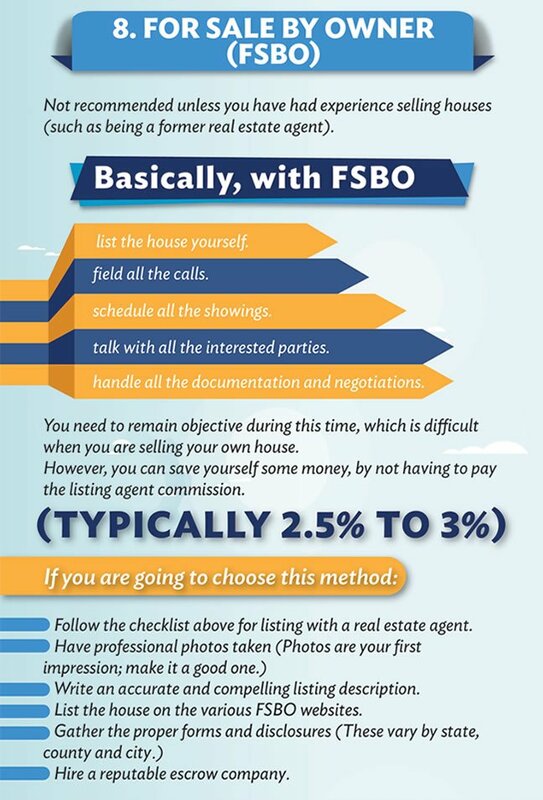 Basically, with FSBO, you list the house yourself, field all the calls, schedule all the showings, talk with all the interested parties and handle all the documentation and negotiations. You need to remain objective during this time, which is difficult when you are selling your own house. However, you can save yourself some money, by not having to pay the listing agent commission (typically 2.5% to 3%). Follow the checklist above for listing with a real estate agent. Have professional photos taken of the house. Photos are your first impression; you want it to be a good one. Write an accurate and compelling listing description. List the house on the various FSBO websites. Gather the proper forms and disclosures necessary to sell your house. These vary by state, county, and city. Hire a reputable escrow company to help you sort through the mounds of paperwork associated with selling a home. Ask yourself whether they are really interested. Have they been talking about buying a home? Do they have the funds and do they qualify for a loan? Have they acted in a way that is trustworthy and straightforward? Or could it be they want to get a really sweet deal and possibly take advantage of you? Use the same paperwork and documentation that you would with a typical buyer whom you don’t know personally, just because they are family or friends does not mean there won’t be issues down the road. Protect yourself no matter what. Make sure all agreements are in writing and notarized. Handshake deals can go bad fast and ruin even the closest relationships. Family and friends can be more difficult than regular buyers. This is probably the most important point of all, so consider having all of your documentation reviewed by an attorney. While none of us really want to pay attorney’s fees, this can be one of the best investments you can make. 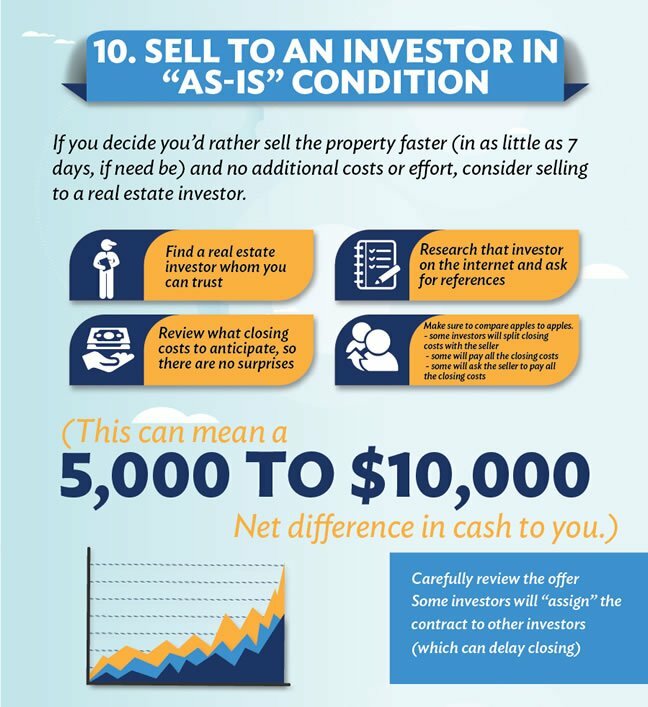 If you decide you’d rather sell the property faster (in as little as 7 days, if need be) and no additional costs and effort, consider selling to a real estate investor. Find a real estate investor whom you can trust, relate to, and work with. Research that investor on the internet and ask for references. Review what closing costs to anticipate, so there are no surprises. Make sure to compare apples to apples, as some investors will split closing costs with the seller, some investors will pay all the closing costs and some will ask the seller to pay all the closing costs. This can mean a $5,000 to $10,000 net difference in cash to you. Also carefully review the offer, as some investors will “assign” the contract to other investors, which can delay closing. Also, some investors will provide a very small deposit, thus not providing much “skin in the game” and some will ask for other stipulations that weren’t previously discussed. So, when in doubt, hire an attorney to review the contract. Whatever you end up deciding to do, just make sure you move forward with a plan and be willing to look at each point objectively. The biggest hurdle is taking action and sticking with it until you get to the end result – the sale of your house! You’ve already taken the first step by reading this checklist! For your convenience, here is the full infographic is below. Feel free to share this post (or infographic) with family and friends. Enjoy!